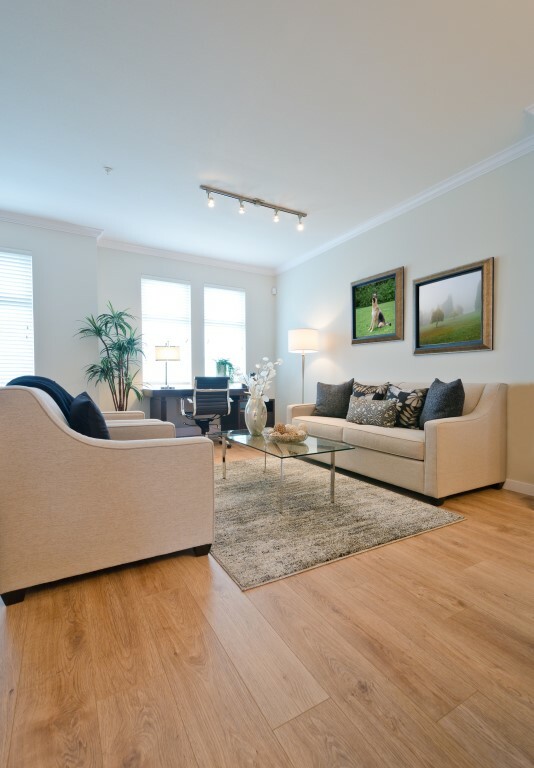 Laminate is a cost-effective alternative to installing real wood flooring in your home. At less than half the price of real wood, it relieves the pressure on your wallet. What’s more, laminate flooring will save you even more money as it won’t require replacing in just a few short years. Real wood has a tendency to fade when exposed to sunlight, however laminate flooring is not affected in this way and is far more resistant to stains, impact damage and scratches due to its durable melamine layer. The core of laminate is extremely strong and is able to withstand up to 1,200 pounds of pressure for every square inch. Featuring a tongue and groove click system, laminate flooring is quick to lay for our fitters. With so many textures and patterns to choose from, you can select the laminate which suits your tastes, requirements and protects your bank balance. When it comes to cleaning your new laminate flooring, a quick dust or vacuum will lift dirt from the surface and a wipe over with a damp cloth will ensure that you don’t have to break a sweat cleaning your floor. If you are an allergy sufferer, you will be pleased to know that laminate flooring doesn’t absorb dust. It won’t expand or contract like real wood can and, if you do manage to damage your floor, it’s very easy and cheap to replace the damaged section. If you would appreciate the look and feel of wood flooring but don’t wish to splurge on it, laminate flooring is the ideal solution, so talk to Crazy Price Carpets today to discuss your needs. Our expert fitters can also arrange to measure and install your new floor. Get in touch on 01287 651 131 or 07525 822 062 to request your free, no obligation quote. If you prefer a more traditional feel, we offer an extensive choice of quality carpets for your consideration.